The Thermal Hotel Visegrád****superior is located in the picturesque Danube bend next to Visegrád, in a peaceful, friendly environment, in the neighbourhood of the Park Forest of Pilis, about 40 km far from the city centre of Budapest. The 4-star superior hotel offers full scale convenience and first class services to our wellness guests who want to find relaxation and recreation as well as to those conference participants who are looking for an ideal environment. 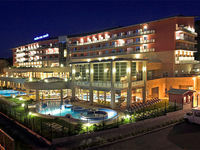 The hotel contains 164 double rooms and 10 suites. Hotel Rooms: All rooms with balcony, baths, individually controlled air-conditioning, LCD TV, Pay-TV, room safe, WiFi, direct dial telephone with mail box, minibar, hairdryer, free bathrobe use. Non-smoking and connecting rooms, as well as special rooms for physically challenged people are available. Well-being & Recreation: Using the relaxing effects of natural resources, our "Well-Being Stays" focus on relaxation, re-energising, beauty and preventative programs. They are recommended dfor active individuals who appreciate their health and are willing to invest in it. We are continually in the process of introducing new and exciting relaxation and wellness treatments. 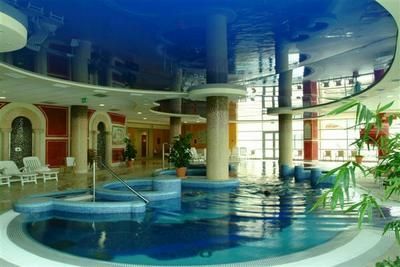 Here are just some of the main services you will find available in the spa: indoor and outdoor fun bath, swimming pool (20 m), outside pool with sun terrace, thermal pools (32 and 38 °C), whirlpool, sauna, aromatic and steam-bath, solarium, fitness room, aqua jogging, private training, squash, table tennis,massages: Thai, aromatic oil, anti-stress; beauty salon: hair dresser, cosmetics, manicure, pedicure, solarium. Conference: The Hotel offers a wide range of ideal settings for company events, conferences, meetings, banquets, receptions, cocktail parties, weddings and garden parties. To organize a memorable event, you can choose from our air-conditioned conference rooms furnished with the latest technical equipment and our restaurants with open-air terraces. On request, our staff will be happy to arrange a variety of services for you: hostess, interpreter, photographer, live music, and organized programs. • Full board is available at 5200 HUF per person. Danube view supplement: 6 EUR / person / night. Prices are valid only on request, except for National Holidays and high seasons. All prices include VAT and local tax.